The Fairborn Police Department swore in five new officers on February 24, and all them are graduates of the Sinclair Police Academy! 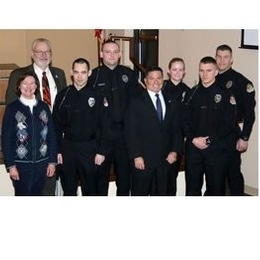 Pictured along with State Representative Rick Perales, Fairborn Councilman Paul Keller and Councilwoman Donna Wilson, are Officer Carpenter, Officer Haydocy, Officer Boggs, Officer Hood, and Officer Zink. This year marks the 25th anniversary of the Sinclair Police Academy. The first class began on September 11, 1989. Since that time, Sinclair has maintained one of the longest continuously operating open enrollment academy programs in the state of Ohio and has become highly respected for the quality of the program and the individuals who complete it. In 2015, the 100th class of the Police Academy will graduate.